The Eight Factors measures four basketball criteria along with four non-basketball criteria to take the measure of who will win each Sweet 16 game. In this installment: 6-seed Cincinnati (26-10) vs. 2-seed Ohio State (29-7) in the Ohio Derby. It’s hard to really call Cincinnati a “college town,” in the same way that you wouldn’t think of schools like NYU or the University of Chicago having college vibes. Nevertheless, it is a city, and while it might not be the brightest star on the American urban landscape, I think we can all agree, without delving into insult or conjecture, that it beats out Columbus, Ohio. 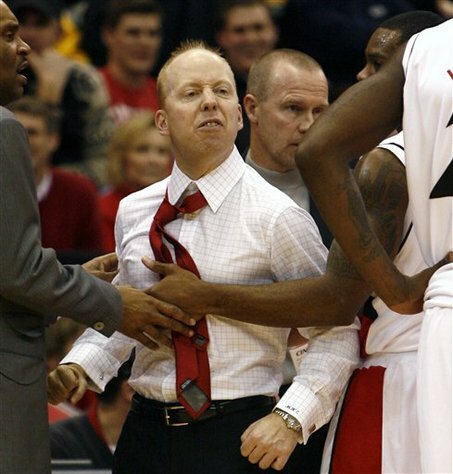 I’m not saying Mick Cronin looks like an angry leprechaun, but if I saw him on the street after the rain died down, I’d follow with both eyes open until we reached the pot of gold. That’s all I’m saying. Cronin is still a young man by basketball standards (40 years old), and he has just three years at Murray State and six years at Cincinnati under his belt. But he’s done well for himself in that time, compiling a 175-106 mark and making the tournament two years in a row. This is his first time in the Sweet 16, but the coaching job he did against Florida State in the Round of 32 proved he’s ready for the stage. Thad Matta is a young man himself (44, which is actually kinda nuts because he looks much older), but he’s already established himself among the upper echelon of college coaches. With a 219-64 lifetime record (.774, which is currently among the top 20 winning percentages ever in Division I), five Big Ten regular-season championships, three conference tournament championships, and a Final Four appearance in 2007, he’s got a good head start on Cronin. Before we give Matta the point, it’s worth noting that in his Ohio State career, he’s had relatively bad luck, and has maybe underperformed, in the NCAA tournament. His first appearance with Ohio State came in 2006, when the 2-seed Buckeyes were blown out by 7-seed Georgetown in the second round. Then came the loss to Florida in the national championship game in 2007, Matta’s best year to date. The Buckeyes followed that two years later with a loss to Siena in an 8/9 game, and the theme continued in 2010 with a loss to 6-seed Tennessee after Ohio State had won the Big Ten and earned a 2-seed. Finally, last season, with what may have been the best team he’d ever assembled, Matta and the 34-3 Buckeyes dropped a 2-point game to 4-seed Kentucky in the Sweet 16. That’s five years in the NCAA tournament, and in four of them the Buckeyes have lost to a lower seed before the Elite Eight. It’s something to keep an eye on this weekend, when Matta once again has a superlatively talented team. A Bearcat and a Buckeye tree. Hey, I’m no scientist, but as far as I can tell only one of those things can piss on the other. It seems like Ohio State always has an insane amount of talent, but this year is a particular embarrassment of riches. There’s Jared Sullinger, a player of the year candidate (kinda) and first-team All-Big Ten, with 17.4 points and 9.1 boards per game. There’s Aaron Craft, the Big Ten defensive player of the year and probably the best perimeter defender in the country. There’s Deshaun Thomas, a pure scorer as a 6-foot-7 sophomore who shoots 53 percent from the field and averages 16 per game. There’s William Buford, another great scorer (14.7 per) who grabs 4.8 boards and dishes out 2.8 assists. Add Lenzelle Smith Jr., a defensive specialist who can hit the open 3, and you have one of the three best starting fives in the country. There’s a reason everyone considered Kentucky, North Carolina, and Ohio State the title hopefuls back in November. Sure, the Buckeyes underachieved a little this season, but that’s in the past. Cincinnati has been a sneaky-good team all season, beating teams like Georgetown, UConn, Notre Dame, and Louisville in its Big East schedule, but it wasn’t until a conference tournament semifinal win over Syracuse that most of us saw their blip on the national radar. For a team that plays very slow, it might surprise you to know that the Bearcats have four players who average in double figures, and a fifth who’s close. Sean Kilpatrick, a 6-foot-4 sophomore, leads the way with 14.3 points and 4.7 boards per game, and he’s followed closely by fellow guard Dion Dixon (13.1, 3.4), 6-foot-9 Yancy Gates (12.4, 9.1), the wonderfully named Cashmere Wright (10.7, 4.6 assists), and Jaquon Parker (9.3 points, 5.6 boards). Aside from Gates, no player in the starting five stands taller than 6-foot-4, so they depend on their guards crashing the boards to help him. It’s worked on the defensive end, but it shouldn’t be a surprise that their offensive rebounding numbers are low. By Ken Pomeroy’s metrics, Ohio State has the best defense in the country. They allow precious few second chances (opponents grab offensive board at a 24.8 percent clip, the second-lowest in the country), and with Craft and Smith shutting down opposing guards on the perimeter, teams shoot 3s against the Buckeyes at a very low rate. The interior isn’t much more attractive, and for a team like Cincinnati with a poor 2-point field goal percentage (46.3, 223rd in D-I), where’s the scoring going to come from? Gates is a tough customer underneath, but he’s going to be severely out-manned, and unless guys like Sullinger and Thomas get in early foul trouble, the inside might be totally closed off. On the defensive end, Cincinnati’s main weakness is allowing offensive boards, and that happens also to be one of Ohio State’s main strengths. However, the Bearcats are effective at keeping teams off the free throw line (a total necessity if they have a prayer), and opponents shoot a low field goal percentage. Cincinnati plays at a very slow tempo, and no opponent has reached the 70-point mark on the Bearcats in regulation since early February. Its best hope is to milk the clock as it did against Florida State, hope Ohio State goes through a cold spell, and keep the Buckeyes off the offensive glass. If all that happens, the game might be close and winnable at the end. If any of it fails, the Bearcats are plainly screwed. Cincinnati is firing on all cylinders in its past six games, with close wins over Syracuse, Georgetown, Marquette, Texas, and Florida State. The only hiccup was a Big East championship loss to Louisville, but even that was a near miss. It’s a team that believes it can beat anybody, and certainly shocked the hell out of me by proving it against Florida State. For a team with such amazing talent, Ohio State has been a bit inconsistent all season. Late home losses to Michigan State and Wisconsin cast some doubt on this team’s abilities, but then the Buckeyes went in to East Lansing and stole a road win on the last day of the regular season to secure a share of the Big Ten title. They finally looked like the team we imagined at the beginning of the season, but Michigan State took that momentum back with a neutral-court win in the Big Ten tournament championship. After two wins to start the tournament, there’s some doubt as to whether Ohio State can win four straight games against elite opponents. I want so badly to pick Cincinnati, but if I did, it would be on the basis of things like momentum and history, rather than the teams that will take the court tonight. As I said in the style section, Cincinnati needs to slow Ohio State’s relatively fast tempo, keep a great offensive rebounding team off the glass better than they keep not-very-good offensive rebounding teams off the glass, and hope the Buckeyes are really cold. But even if every single one of those things come to pass, which they won’t, I still don’t see how Cincinnati’s going to score. Ohio State by 15.